Looking for a cool new container for snacks that will travel with you and won't weigh you down? Check out Squishy Bowls by Guyot Designs! 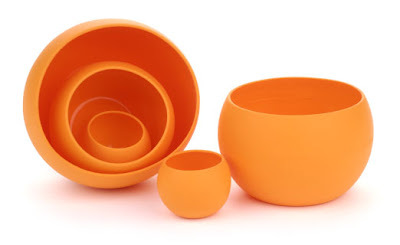 These patent pending bowls and cups are cool and convenient for the girl (or guy) on the go! 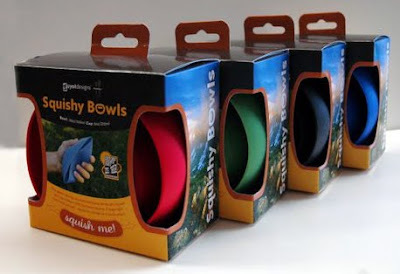 Squishy bowls can be easily tossed in a purse, bag, or backpack. Pull out, pop up, pour in and settle in - it's an instant snack or drink container! They are perfect for hot or cold foods. So you can use them for a quick dry snack (as pictured at left) or a bowl of soup! I was recently sent a set of Squishy Bowls that included a large bowl (3.3 oz) in Celery and a cup size (1.7 oz) in tahoe blue. I was immediately struck by how fun the colors were! DH couldn't believe how little space that they took up and they are so lightweight you can literally take them anywhere! But the best part about Squishy Bowls and Cups is that these babies are durable! They are made to retain their shape - so you can take them anywhere without the fear of them being crushed or broken. Perfect for kids or anyone who might have a tendency to drop things (me!) These bowls are easy to clean and reuse and are dishwasher, freezer and microwave safe! How cool is that? With vacation season coming up I'm thrilled to be able to take my squishy bowls with me. It will be great to throw them in my luggage and pull them out to hold snacks at the pool or beach. Buy it: Squishy Bowls are available at REI, Eastern Mountain Sports, Dicks, Mountain Equipment Co-Op, Reusablebags.com and on the Guyot Designs Web Site! Win it: One lucky Frugal & Fabulous reader will win a Squishy Bowl Set of their Choice! *Tell me your favorite product from Guyot Designs! You have until Wednesday, March 3 @ 7pm EST to enter! (Winner must respond within 48 hours.) Giveaway open to U.S. residents only. I like the squishy bowls. I'd love to try the MicroBites™! oh wow, i love the Fireflye bottle, very cool! Those fireflye things are cool! Squishy Bowls in Tomato Red is gorgeous. I would Love to win this giveaway. I think the travel shot is super cute! Those bowls are so cute! I like the pet bowls. I love the med. size bowls, flexable and perfect for little hands. Thank you for the chance to win my first entered giveaway. Oh dear being number one is probably not lucky but I do love these bowls - especially the large squishy bowl in celery color. Love anything green! I also love the tapguard! I like the squishy pet bowls. I like the commuter stainless steel bottle. Those squishy bowls are cool! I would like any of the squishy bowls in celery. Oh so pretty! I love the Tapguard. Thanks for the giveaway. Out of everything I like the squishy bowls the best. *I like the Squishy Pet Bowls! I actually like a couple of things: the tap guard and the fireflye! The TapGuard and the squishy pet bowls both look awesome, thanks! Hi! The Gription looks so functional and neat! Thanks for this giveaway. The squishy pet bowls would be really handy. Thanks for the chance! I like the squishy bowls, great for snacks! I entered the down east basic giveaway! I entered your down east basics giveaway! I like the squishy pet bowls! They also have some cool utensils. I really like their TapGuard. facebook fan (Jen Voss)of frugal and fabulous. facebook fan (Jen Voss)of Guyot Designs. I love the squishy pet bowls, these are really neat! And they won't clink on your tiles when you stick them on the floor in the kitchen like other bowls do! I love the splash guard, that is a genious idea! My favorite is the Standard Stainless Bottle. Thanks. I like the Squishy Pet Bowls! Thanks! I entered the DownEast Giveaway! I became a Facebook Fan of Guyot Designs! I actually like the bowls you are giving away. 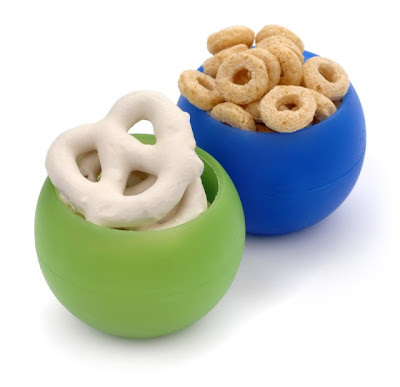 If I had a dog, I'd really like the squishy pet bowls. I receive your email newsletter!! I love the squishy pet bowls. My cat loves to move his water bowl around and get the water all over the place, I don't think he could do that with these!! I like their MicroBites, the smaller version of their also-too-cool Utensils! I also entered the Down East giveaway. My favorite product from Guyot Designs is the The MealGear MicroBites! I'm a facebook fan of Guyot Designs under username Jennie Tilson. I like the FireFlye water bottle/lantern. How unique. The squishy bowls look cool...i love the red! With a kid off to college, these would be perfect for him to take along! I think the Fireflye is also an ingenius idea! I also like the Squishy Pet Bowls. the Squishy Pet Bowls are very cool even though I dont have a pet!